Using the elements from the periodic table to make up words, phrases or sayings is fun, this is another cheeky yet smart way to do this. On the front of this t-shirt you will find a very fun and super smart saying of “Are You Copper And Tellurium? Beacause You’re CuTe”. The “CuTe” in the t-shirt uses the elements from the periodic table Copper (Cu) and Tellurium (Te) to form the word cute, so clever. Made from 100% cotton this t-shirt is available in a wide variety of sizes that will range from Small to 4XL and you have a choice between 8 different fun and vibrant colors to get this print on. 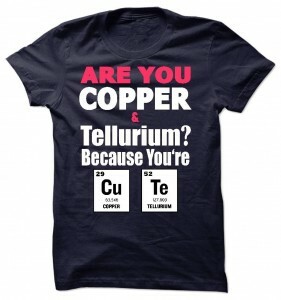 Try out the Are You Cute Copper And Tellurium Cute T-Shirt. Surprise someone with your t-shirt. How you may ask? Easy check out this t-shirt with the element Ah!, ok maybe it is not a real element but I think it is now. Ah! 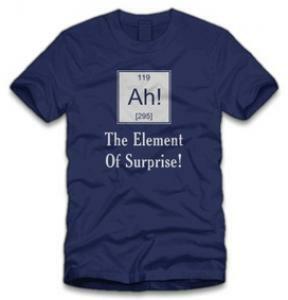 is the element of surprise and that is what you will find on this t-shirt, Ah! looking like it is an element from the periodic table and the saying ” The Element Of Surprise! “. This t-shirt will be durable and comfortable as it is made from 100% cotton, available in a wide variety of sizes and colors. Get your Ah! The Element of Surprise T-Shirt. Are you one of those people who knows the elements? If so then this would be the shirt for your because it spells GEEK in elements. 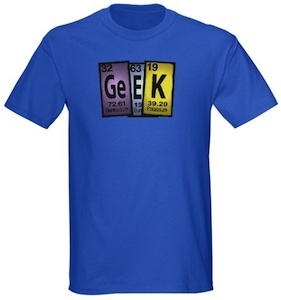 Check out this Geek Elements T-Shirt.